Born: 2nd October 1886, 25, Potter Street, St. Clement’s, Ipswich. Died: 22nd January 1916; KiA. 1891 No. 3, in Yard, Short Lane, Ipswich. William was 4 years old and living with his parents, twin brother & siblings. Robert Davey, 38, a General Labourer, born Albert Street, Ipswich. Agnes Davey (nee Birch), 38, born Freston, Suffolk. Annie Hannah Davey, 13, born Ipswich. John Robert Davey, 9, born Ipswich. Ada May Davey, 7, born Ipswich. Herbert Arthur Davey, 4, born 25, Potter Street, St. Clement’s, Ipswich. 1901 14, Hamilton Street, Ipswich. William was 14 years old, an Errand Boy. He was living with his widowed father, twin brother & sisters. Ada, 17, a Corset Hand Stay. Herbert, 14, a Wood/Timber Dealer – own account. Florence Rebecca Davey, 8, born Ipswich. Ethel Davey, 6, born Ipswich. Mary A. Oxer – the Housekeeper. William Oxer, her 14 year old son. 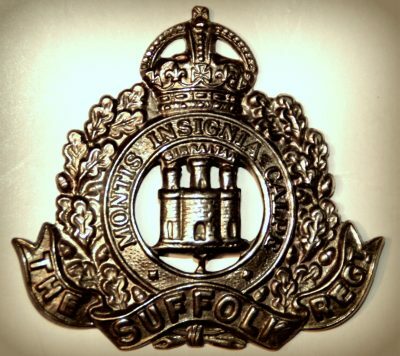 William was 23 years old, a Soldier ranked Lance Corporal for the 1st Battalion of the Suffolk Regiment. William’s mother, Agnes Davey died 1897, Ipswich. His father, Robert Davey died 1913, Ipswich. Soldiers’ Effects to Herbert & John Davey – brothers, and Ada Pike, Florence Grout & Ethel Davey – sisters.